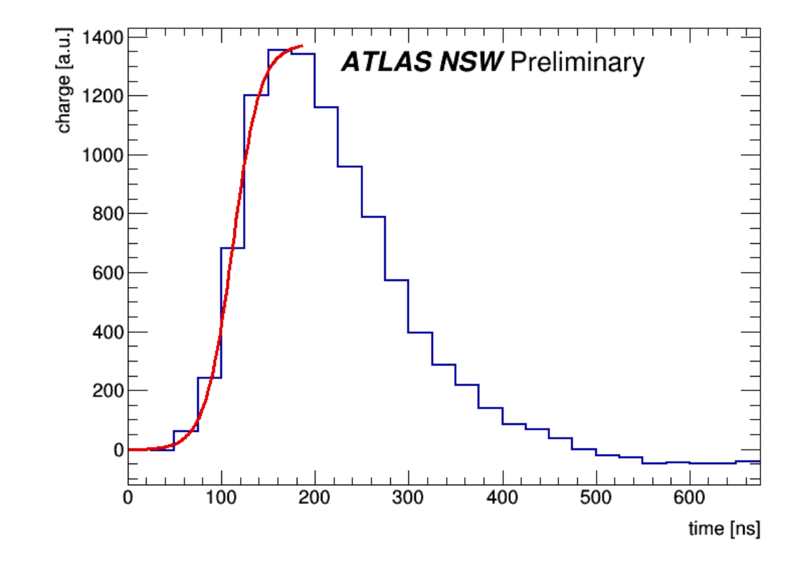 The plots shown below have been approved by the NSW Project and may be shown by ATLAS speakers at conferences. Do not add plots on your own but contact the NSW project leader to arrange a plot approval. 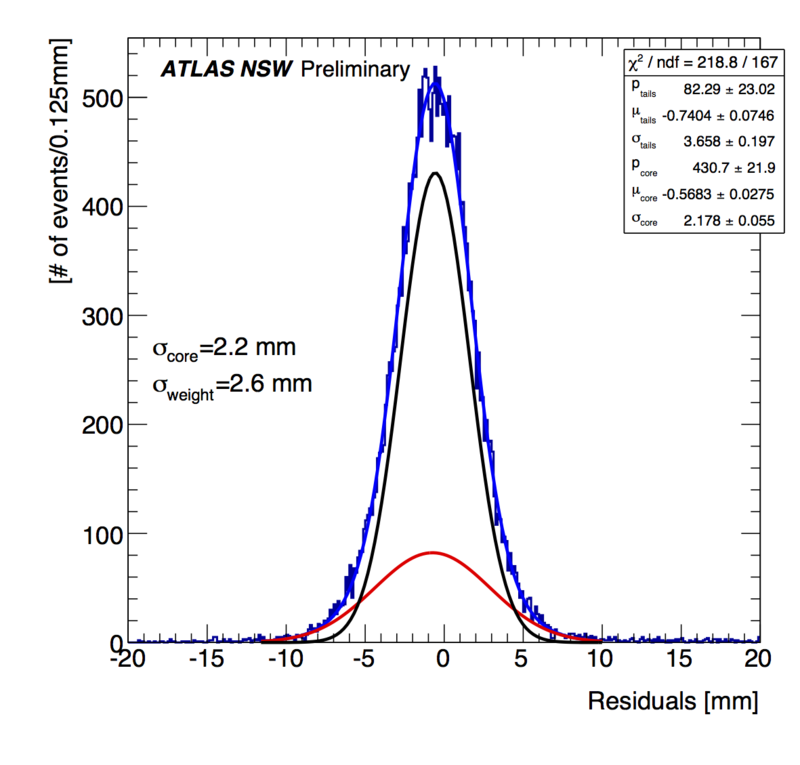 Plots and data concerning NSW detector performance, including test beam and/or module-0 results, can only be shown publicly if approved. Plots/results are approved by the NSW project leader after a discussion in the NSW Steering Group. Before requesting the approval of a plot, it should be presented, discussed and agreed on in the appropriate community, eg using the MicroMegas or sTGC Weekly meetings. The official plot approval procedure is in place since October 2014, it was defined together with and endorsed by the Muon IB in its session on October 16 2014. Here is the Technical Design Report from 2013. The link also provides access to the individual figures of the TDR. Here is a list of Muon System talks given at conferences. Here is a list of NSW, sTGC and MM talks given at conferences. In the following, performance studies of Micromegas detectors performed with test-beams on several small (10x10 cm2) / medium(1x0.5 m2) size resistive chambers will be reported. Tmm type bulk resistive MM(Tmm2,..., 6) with 10 cm x10 cm active area, with strips 150 μm wide and with a pitch of 250 μm. The resistive strips follow the readout strips geometry with resistivity 40 MOhm/cm. The woven stainless steel mesh structure has a wire diameter of 18 μm and is segmented in 400 lines/inch corresponding to a mesh pitch of &approx 63.5 μm. The support pillars have a diameter of 300 μm with a pitch of 2.5 mm. Tmb similar to Tmm type. The support pillars have a diameter of 500 μm with a pitch of 5 mm. T type bulk resistive MM (T1,..., T8) with 10 cm x 10 cm active area, readout strips 300 μm wide with 400 μm pitch. The resistive strips follow the readout strips geometry with resistivity 20 MOhm/cm. The woven stainless steel mesh structure has a wire diameter of 18 μm and is segmented in 400 lines/inch corresponding to a mesh pitch of 63.5μm. The drift electrode had also a mesh structure with a density of 325 lines/inch (wires of 30 μm diameter with a pitch of 80 μm). MMSW (MM for the Small Wheel): the first 4-layers prototype, 1 m x 0.5 m, in a configuration similar to that of the MM for the NSW. It has two planes with parallel strips (precision) and two planes with (stereo) strips rotated by (+/-) 1.5 degrees with respect to the precision ones for second coordinate measurement. The strip pitch is 415 μm and it has a "floating mesh" as opposed to the bulk technique. The mesh structure has a wire diameter of 30 μm and a pitch of 80 μm. The resistivity used in the resistive strips is 10 MOhm/cm. 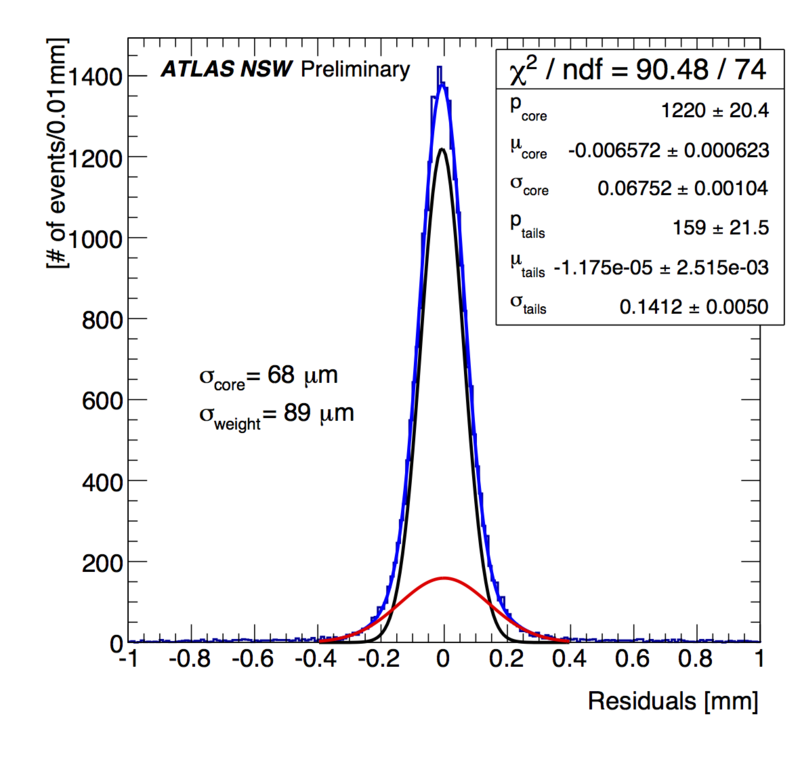 All chambers have a 5 mm drift gap and a 128 μm amplification gap. When not explicitly specified the chambers were operated with a gas mixture of Ar+7%CO2, a drift electrical field of 600 V/cm and an amplification HV in the range 540-580 V corresponding to a gain roughly 10000. The chambers are always readout with APV25 chips connected to the SRS system. Typical integrated charge from one MicroMegas strip readout with the APV25 hybrid cards (through the Scalable Readout System) operated at 40 MHz with 27 samples. A fit with a Fermi-Dirac function with an additional baseline is performed to determine the strip-hit time, which is defined as the inflection point of the fitted function. 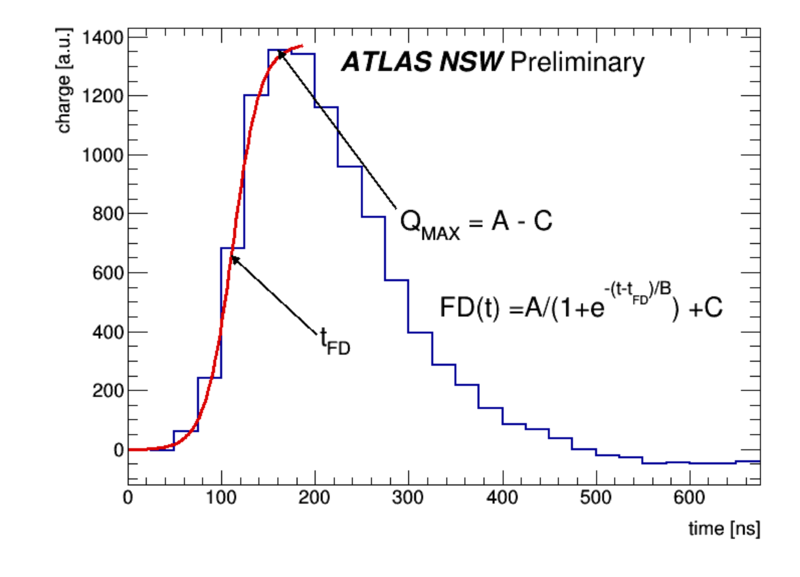 Strip-hit charge is measured in the anlayses from the maximum of this distribution or from the plateau of the FD function, in both cases subtracting the fitted baseline. 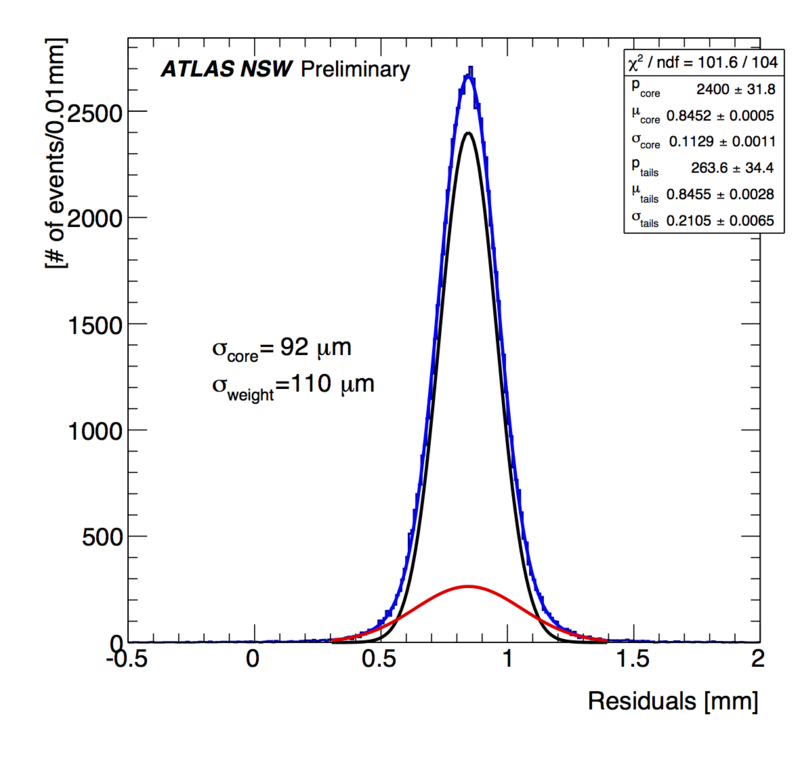 Display of an event acquired with chamber T4 on particles with a 30 degrees inclination during a test beam at H4. (Bottom) charge read by each of the strips. 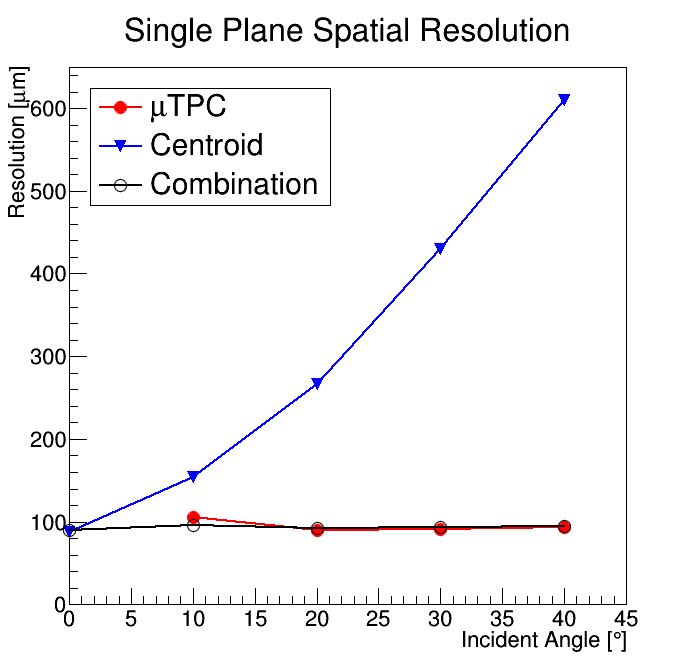 (Top) reconstructed centroid and μTPC track. 2D hit reconstruction in a Tmm chamber during a high statistics run. For this study the chamber was kept perpendicular to the beam axis. The hit position in both X and Y readouts is calculated using the centroid method and only events with a single cluster per readout (perpendicular tracks) are used. The inefficient spots appearing every 2.5 mm, corresponding to the pillar structure supporting the mesh of the chamber, are visible. 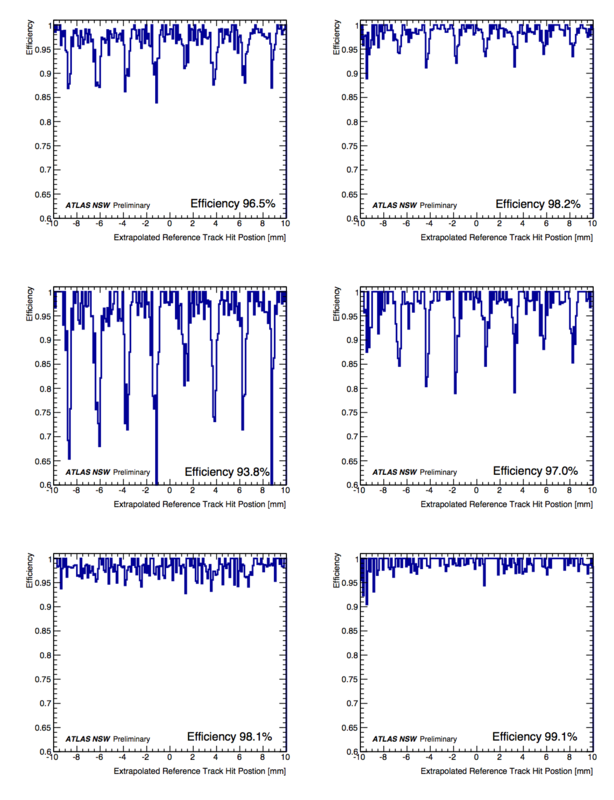 Four different representations of the same plot are shown. The measurements were performed with a Tmm type MM bulk resistive chamber operated with an amplification voltage of HVamp = 540 V. The data were acquired during PS/T9 with a 10 GeV/c π+/p beam. 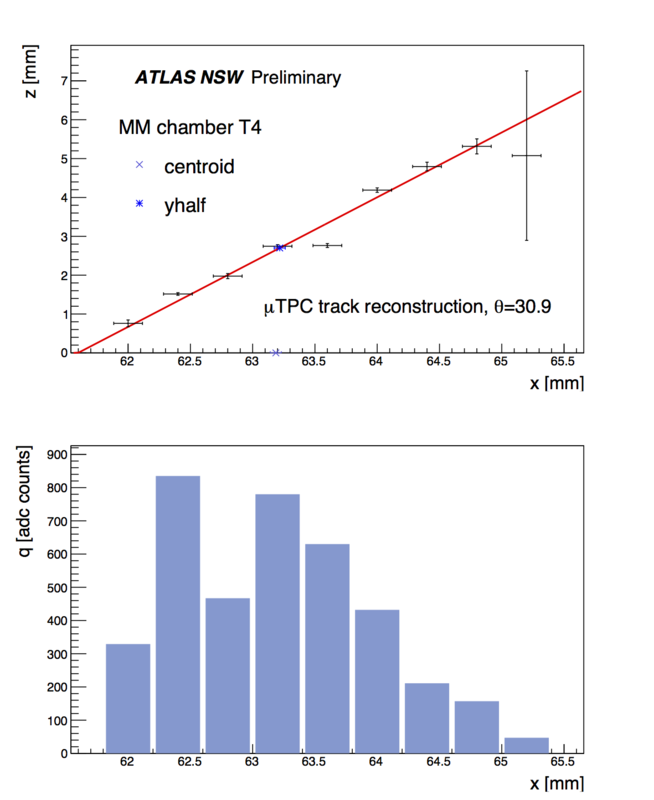 Hit reconstruction efficiency as a function of the extrapolated reference track hit position for a 2D readout chamber of Tmm type. The reference track is reconstructed from 3 Tmm chambers and is then extrapolated to the fourth Tmm under study. Left column corresponds to X and right column corresponds to Y. The first row shows the efficiency for an irradiated area 20 mm wide. The efficiency dips 15% appearing every 2.5 mm correspond to the pillar structure supporting the mesh. The second row focuses only on selected areas on the Y readout of the chamber which are around the pillar region (bands 500μm). The effect of the pillars is more severe in these regions reaching local efficiency dips of the order of 40%. By scanning only the region in between the pillars the efficiency is uniform along the readout channels and a high efficiency is measured for both layers (above 98%). The Y readout shows higher efficiency owing to the fact that it is right below the resistive strips and thus it accumulates more charge than the X layer. Hit reconstruction efficiency as a function of the extrapolated reference track hit for 2 small T type bulk resistive MM chambers namely TQF, T2. The reference track is reconstructed from 4 Tmm chambers and is then extrapolated to the chamber under study. 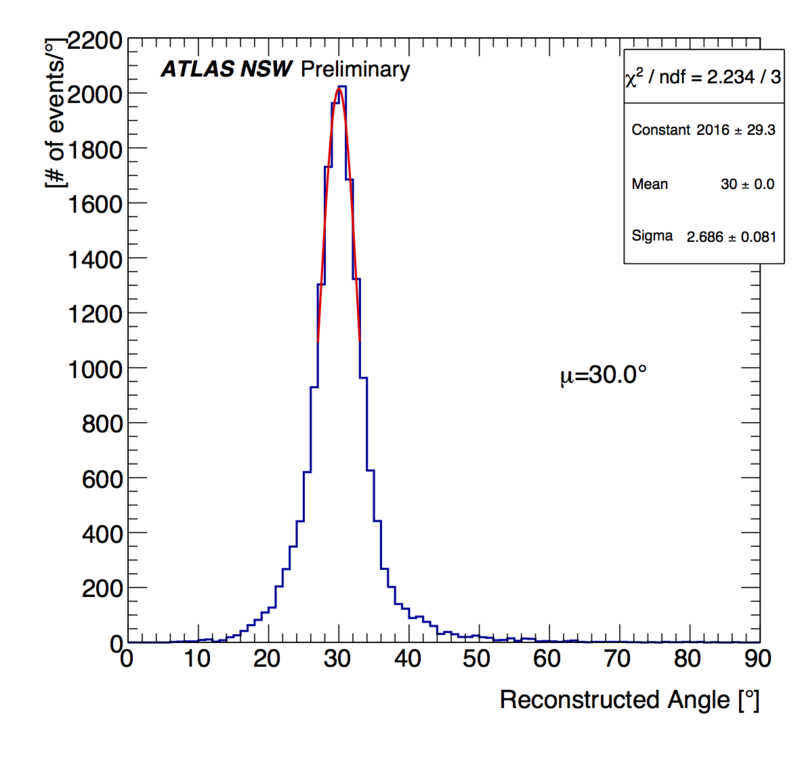 The two plots on the left correspond to data acquried with the chambers perpendicular to the beam axis while for the two right plots the chambers were inclined by 30 degrees. In both cases the centroid method is used for the reconstruction of the hits. The efficiency dips (5%) appearing every 5 and 2.5 mm respectively correspond to the pillar structure supporting the mesh. The pitch between the pillars and their size are different for the two chambers under study as it is evident from the plots. The TQF chamber has 500 μm wide pillars with a pitch of 5 mm while the T2 pillars are $300μm wide with a pitch of 2.5 mm. In the case of the inclined chambers the particles traverse the chambers under an angle inducing signal in larger number of strips compared to the 0 degrees case. In this case the efficiency is expected to be unaffected by the pillars as it is shown on the two plots corresponding to the 30 degrees case (above 99%). The measurements were performed with T type MM bulk resistive chambers operated with an amplification voltage HVamp = 540 V. The data were acquired during PS/T10 with a 6 GeV/c π+/p$ beam. Apart from the efficiency the pillar structure affects also the hit reconstruction intriducing a bias in the hits reconstructed in their region. 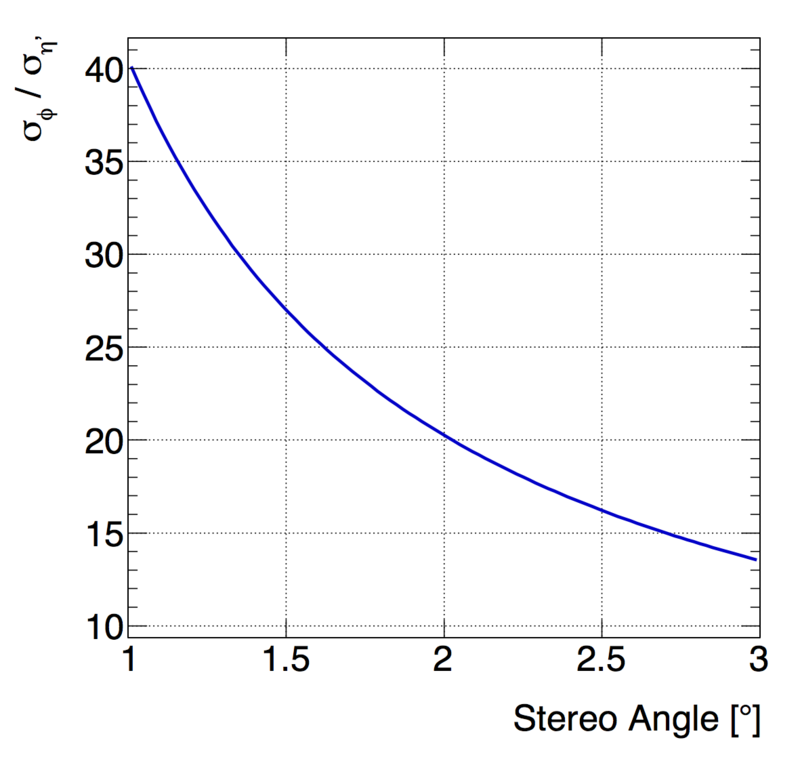 This effect (bias) is studied using a set of three Tmm chambers to reconstruct a reference track which is then extrapolated to a fourth Tmm chamber. Chambers are kept perpendicular to the beam and the hit in each chamber is reconstructed using the centroid method. 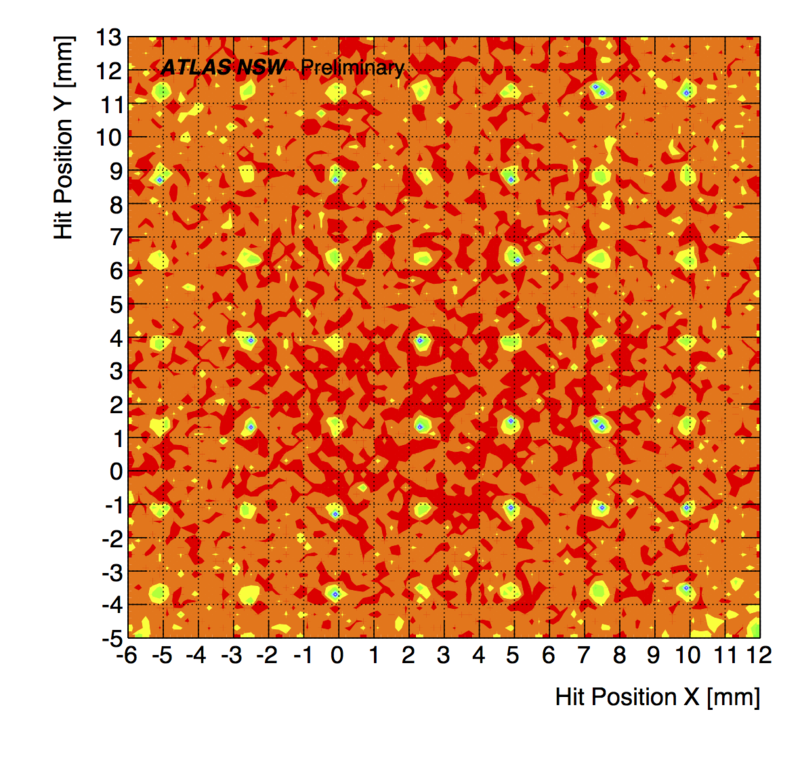 In the top plot, the residuals between the hit reconstructed in the chamber under study and the reference tracks are plotted versus the reconstructed hit position. 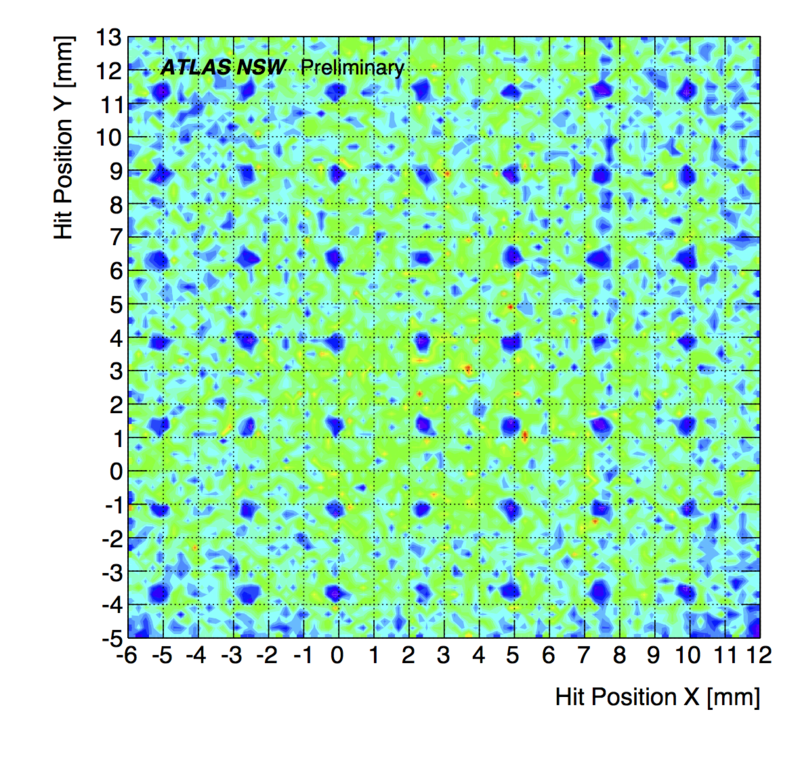 In the bottom plot the reconstructed 2-D hit position in the same chamber is plotted. The position of the pillars is clearly visible in the bottom plot and the observed bias in the reconstructed hit position can be associasated with the position of the pillars comapring the two plots. 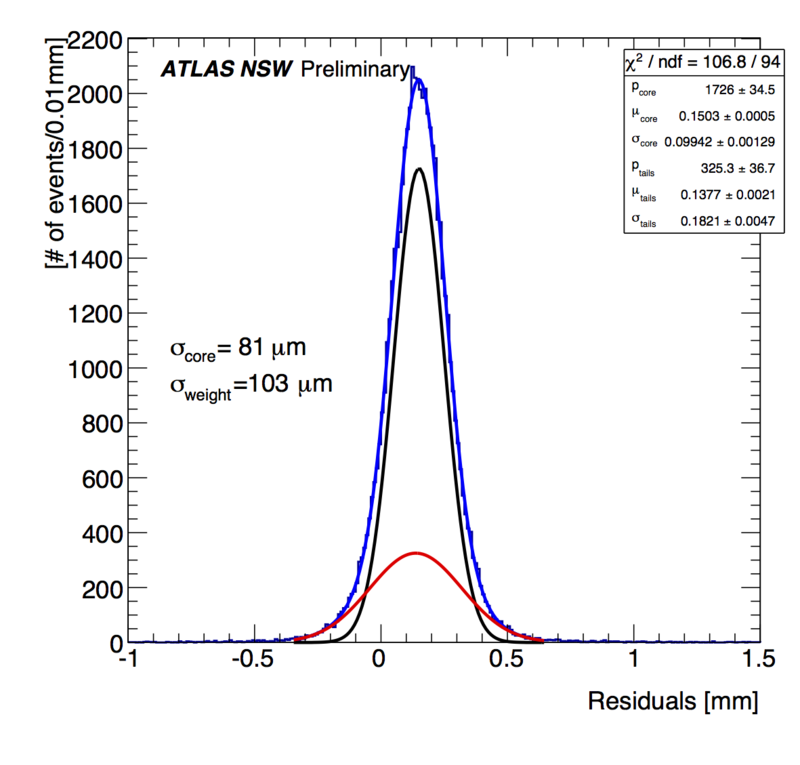 The bias is evident in each pillar region with a maximum value 150μm. The measurements were performed with Tmm type MM bulk resistive chambers operated with an amplification voltage HVamp = 540 V. The data were acquired during PS/T9 with a 6 GeV/c π+/p$ beam. 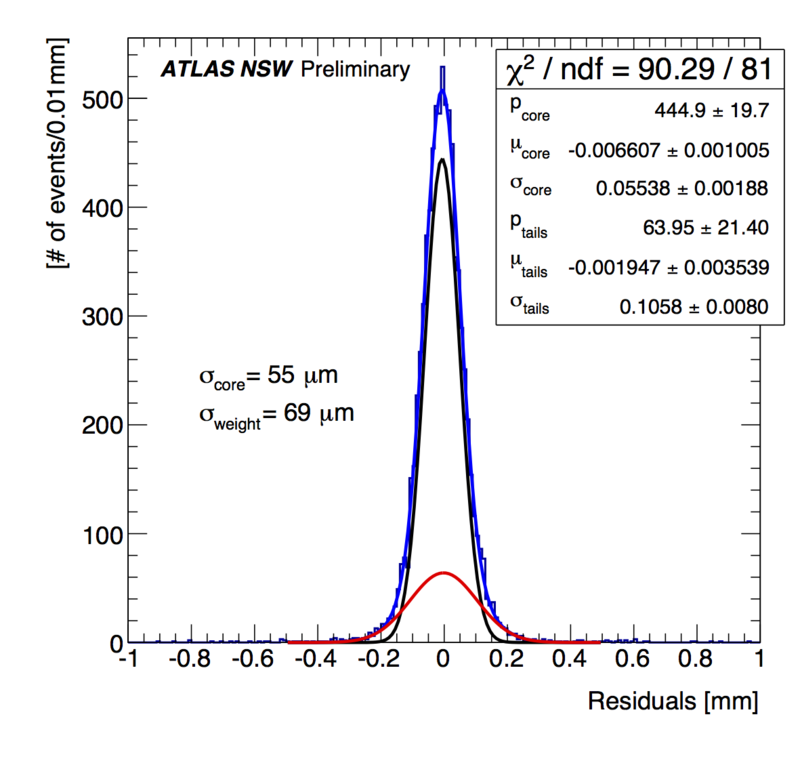 Residual distributions from the hit position difference between a Tmm and a Tmb chamber, divided by √2 (assuming similar resolution for both chambers sice the effect of the different pillar pattern is negligible), featuring a 2D readout. The left plot corresponds to the residuals of the X readouts while the right one shows the Y hit residuals. For this measurement the chambers were kept perpendicular to the beam and the hit reconstruction was done using the centroid method selecting single cluster events in both chambers. A similar performance, in terms of spatial resolution, for X and Y readouts is observed. 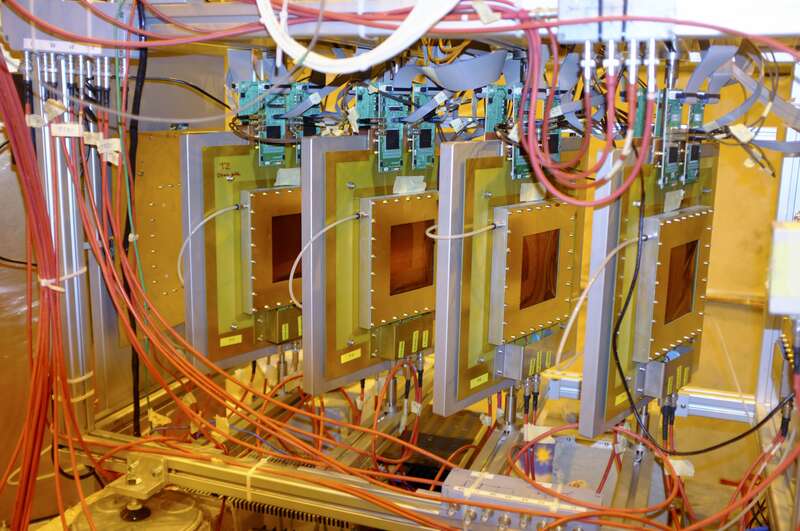 The measurements were performed with Tmm and Tmb type MM bulk resistive chambers operated with an amplification voltage HVamp = 540 V. The data were acquired during SPS/H4 testbeam with a 150 GeV/c μ/π+ beam. 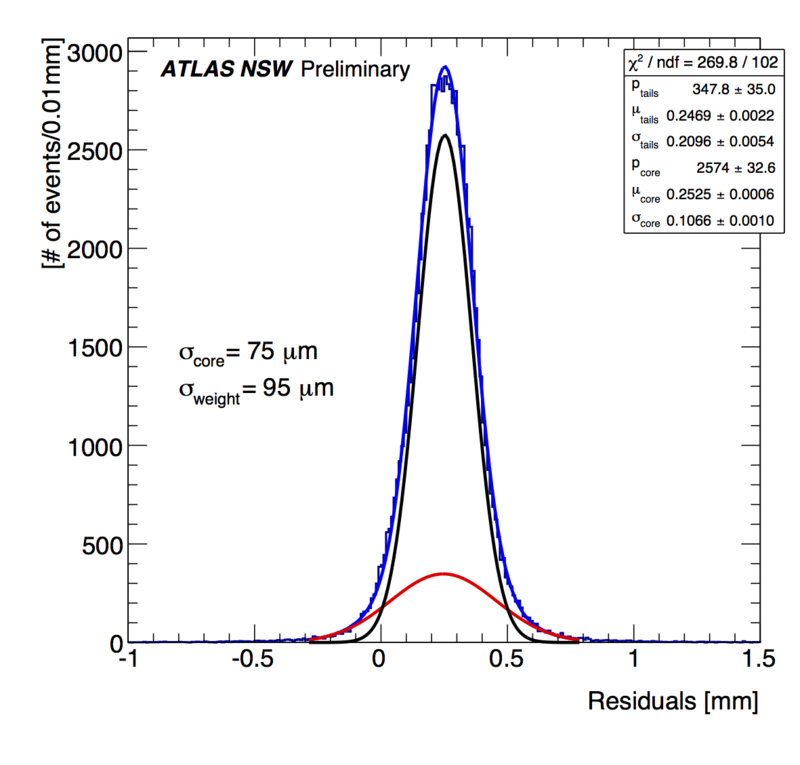 Residual distributions from the hit position difference between two T type MM chambers (T2,T4) , divided by √2. 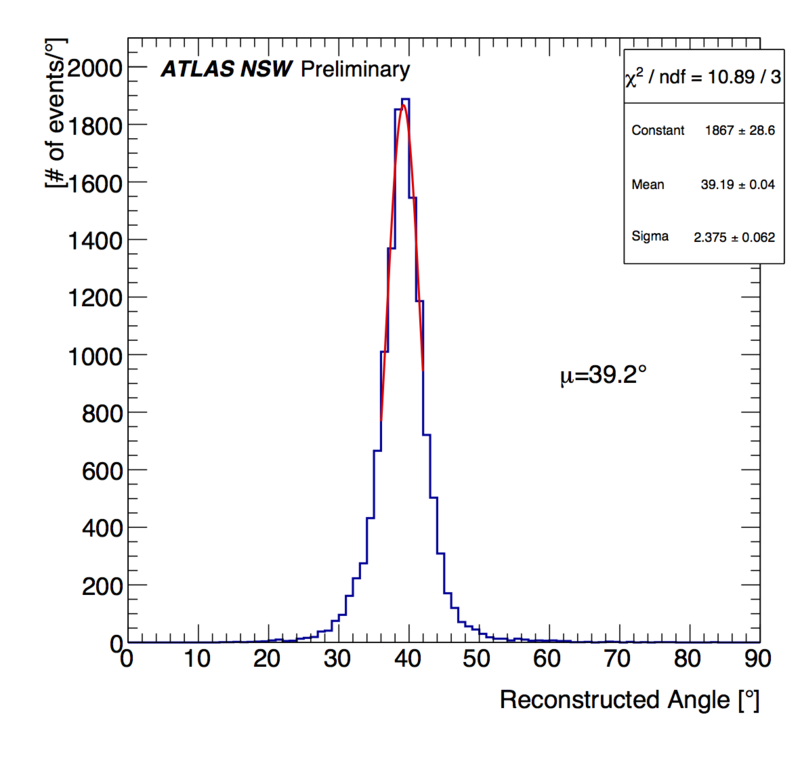 For this measurement the chambers were kept perpendicular to the beam and the hit reconstruction was done using the centroid method selecting single cluster events in both chambers. The measurements were performed with T type MM bulk resistive chambers operated with an amplification voltage HVamp = 550 V.The data were acquired during SPS/H4 testbeam with a 150 GeV/c μ/π+ beam. The MMSW is the Micromegas Quadruplet Prototype. Residuals between the first and the second layer of the MMSW, both with strips measuring the precision coordinate, divided by √2 (assuming similar resolution for both layers). The measurements were performed with the MMSW quadruplet operated with an amplification voltage $HVamp = 580 V. The data were acquired during PS/T9 with a 6 GeV/c π+/p$ beam. Left: Residuals between the second and the combination of the two stereo readout layers. Right: Residuals between the first and the combination of the two stereo readout layers. 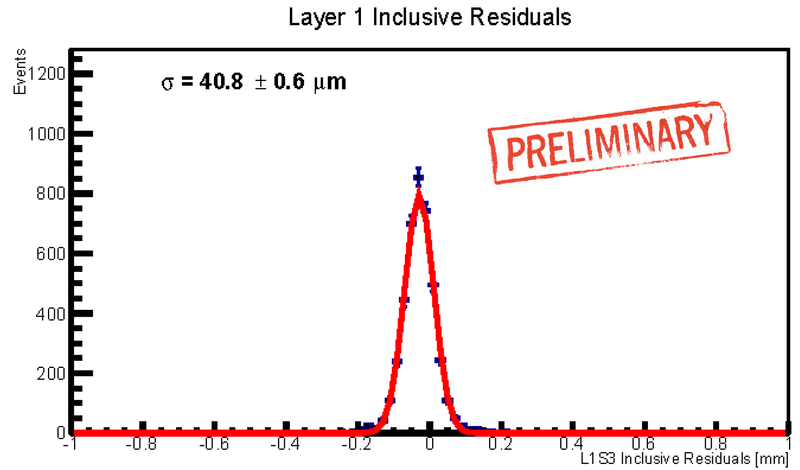 The residuals are divided by √1.5 (assuming similar resolution for all 3 layers) because the second hit is reconstructed by combining the two stereo layers (T.Alexopoulos et al., ATL-MUON-INT-2014-005}).\The observed degradation of the measured spatial resolution is mainly owing to the multiple scattering in the material between the layers under study and thus is proportional to the distance separating them (L1,2<L2,34<L1,34). 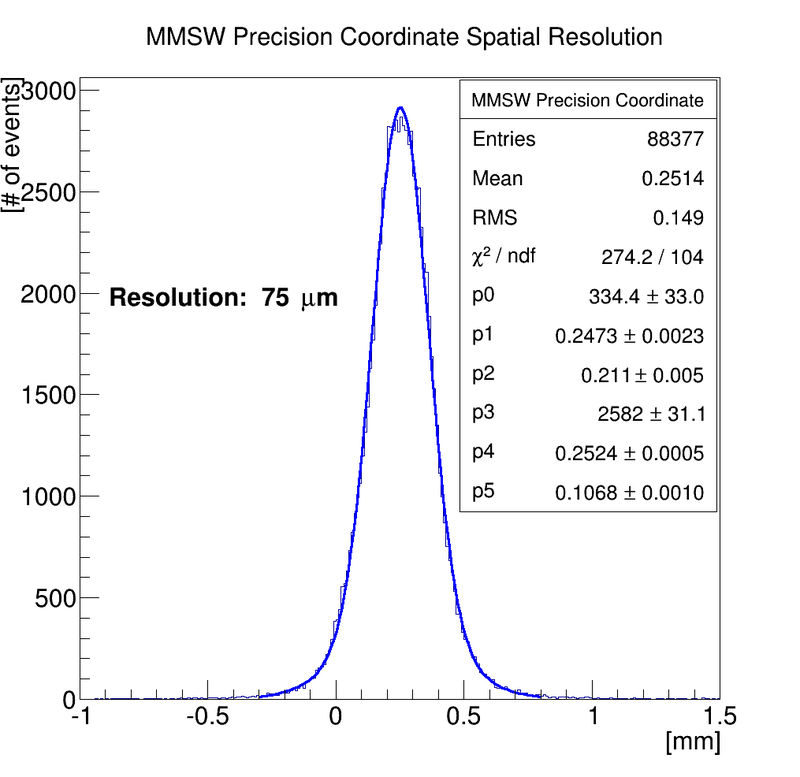 The worse resolution measured compared to the Tmm case is mainly attributed to the different strip pitch. 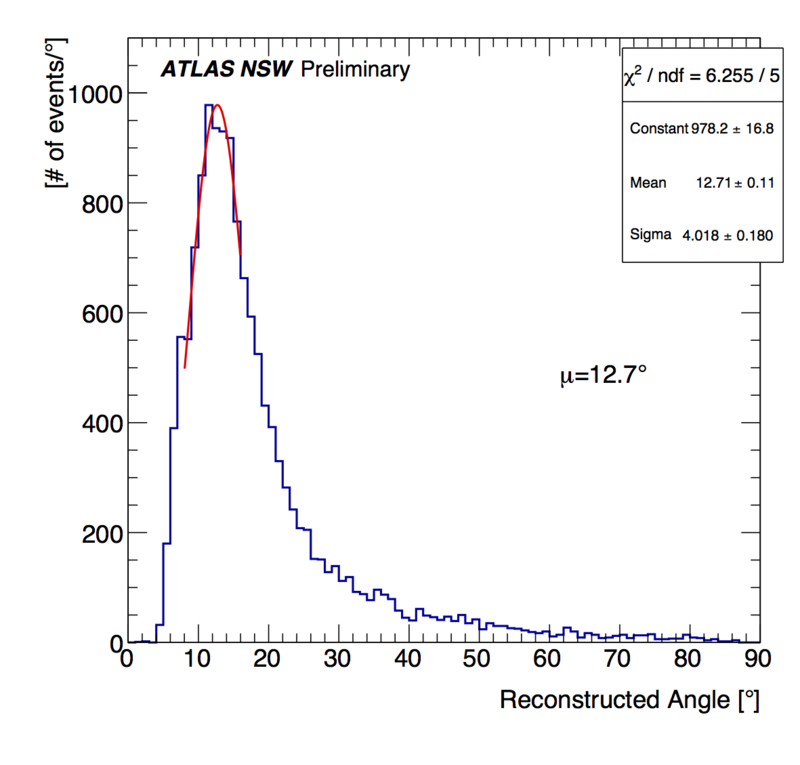 Left : Residual distributions from the hit position difference between the 2nd coordinate hit, reconstructed using the stereo readout 3 and 4 layers of MMSW, with a 2nd coordinate hit reconstructed in one reference chamber at a distance 20 cm from the first plane of the MMSW. Both chambers wee perpendicular to the beam axis and the hit per layer is reconstructed using the centroid method. Right : MC simulation of the ratio between the resolution of the 2nd hit reconstructed combining two stereo layers with the precision coordinate resolution of each stereo layer as a function of the stereo angle value (T.Alexopoulos et al., ATL-MUON-INT-2014-005 ). 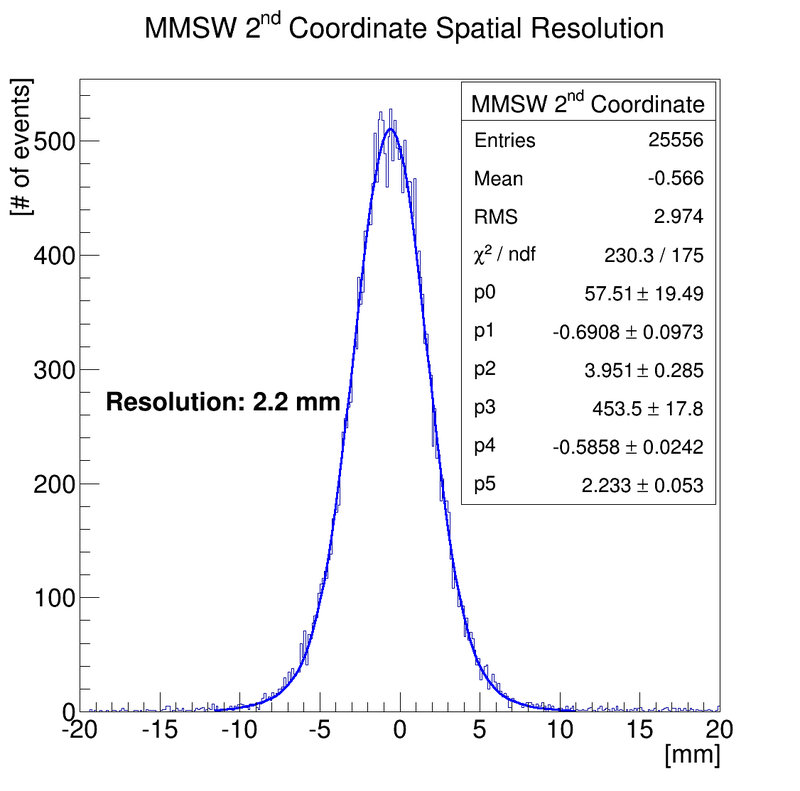 For a stereo angle of 1.5 degrees, as in the MMSW case, we expect this ratio to be 27 which is in good agreement with our measurement. Angular distributions reconstructed with a T type MM chamber with the μTPC method for four different chamber inclination angles with respect to the beam axis (10, 20, 30, 40 degrees). The long tails correspond to badly reconstructed tracks because of wrong timing determination or owing to clusters with small number of strips. The mean reconstructed angle is estimated by fitting a gaussian on the peak of the distribution. 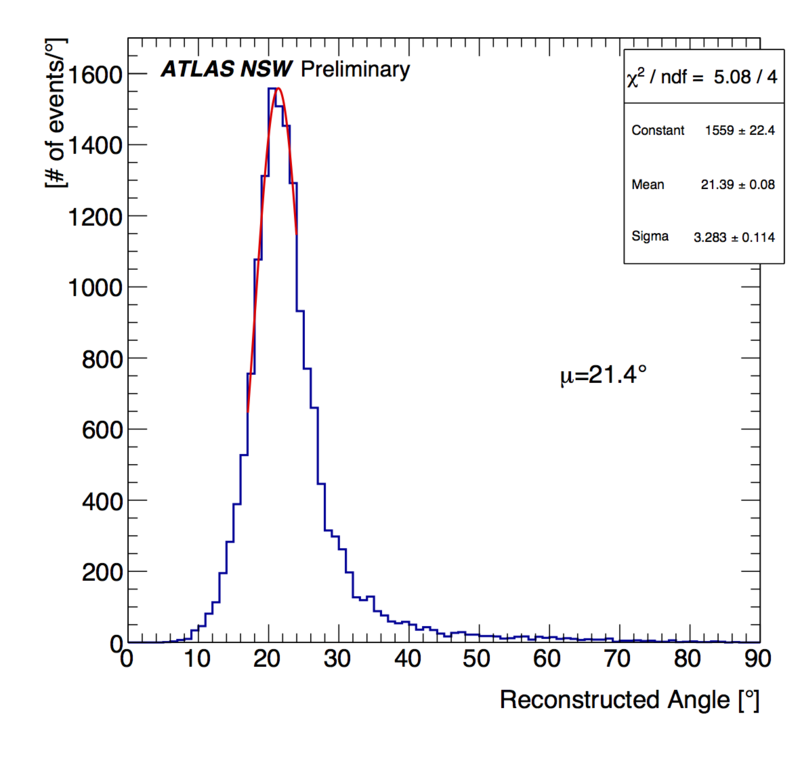 The angular resolution (width of the gaussian) improves with increasing the incidence angle of the track owing to the fact that there is a larger number of points (strips) to be used for the reconstruction of the track. The measurements were performed with T type MM bulk resistive chambers operated with an amplification voltage HVamp = 510 V.The data were acquired during SPS/H4 testbeam with a 150 GeV/c μ/π+ beam. 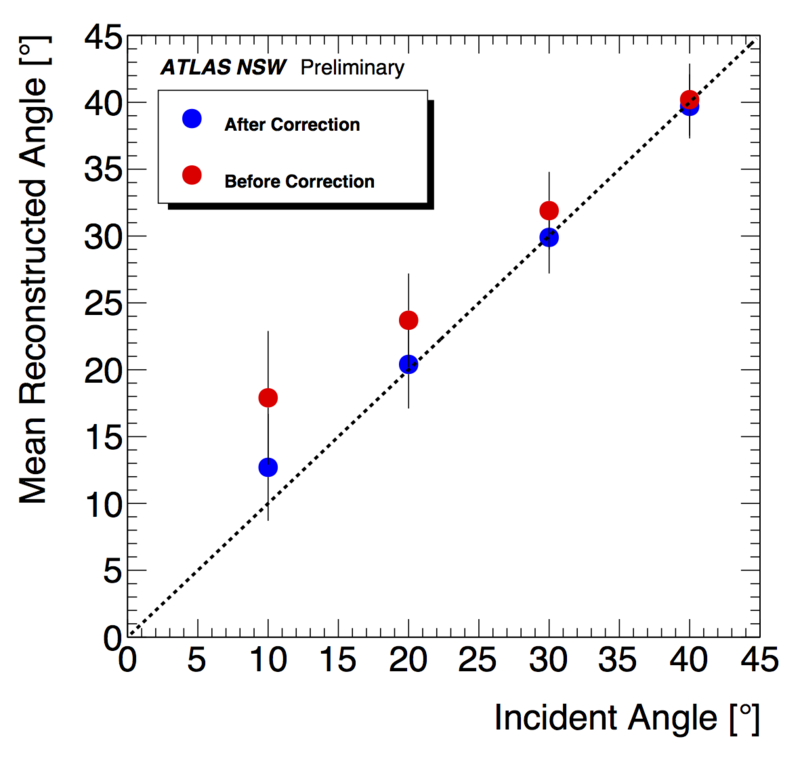 Left: Comparison of the mean reconstructed angle for different chamber inclination angles with respect to the beam axis before (blue markers) and after (red markers) the refinement of the μTPC method. When the μTPC method is corrected for the effect of the capacitive coupling between neighboring strips and the charge position assignment in the edges of the cluster a significant reduction in the observed mean reconstructed angle bias is observed. The remaining bias is attributed to the remaining effect of the capacitive coupling between the middle strips of the cluster. 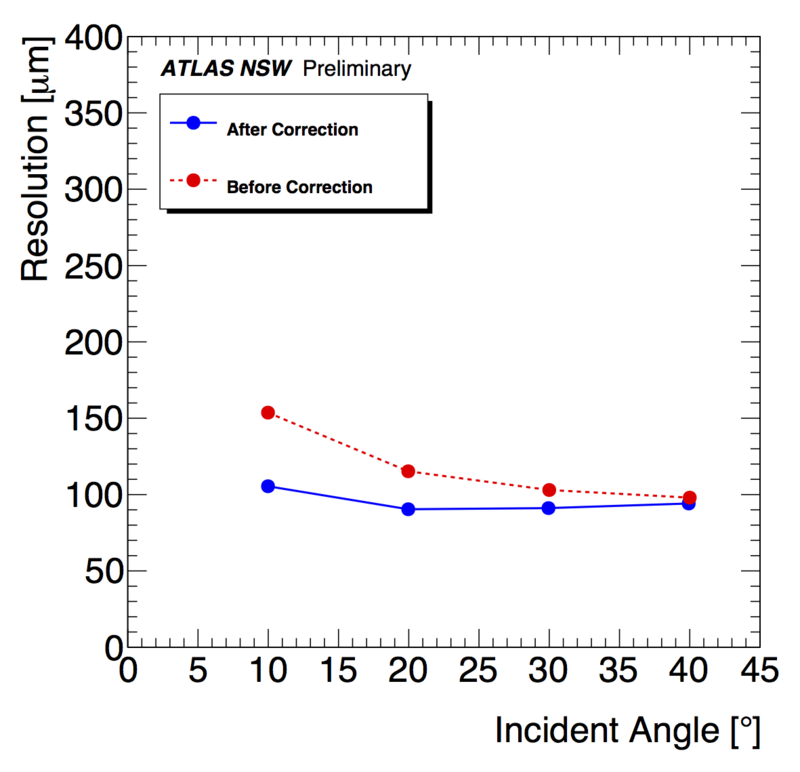 Right: Comparison of the spatial resolution measured for different chamber inclination angles with respect to the beam axis (blue markers) and after (red markers) the refinement of the μTPC method. The refinement of the μTPC method results in a siginficant improvement in the measured spatial resolution (especially for the 10, 20 degrees case). 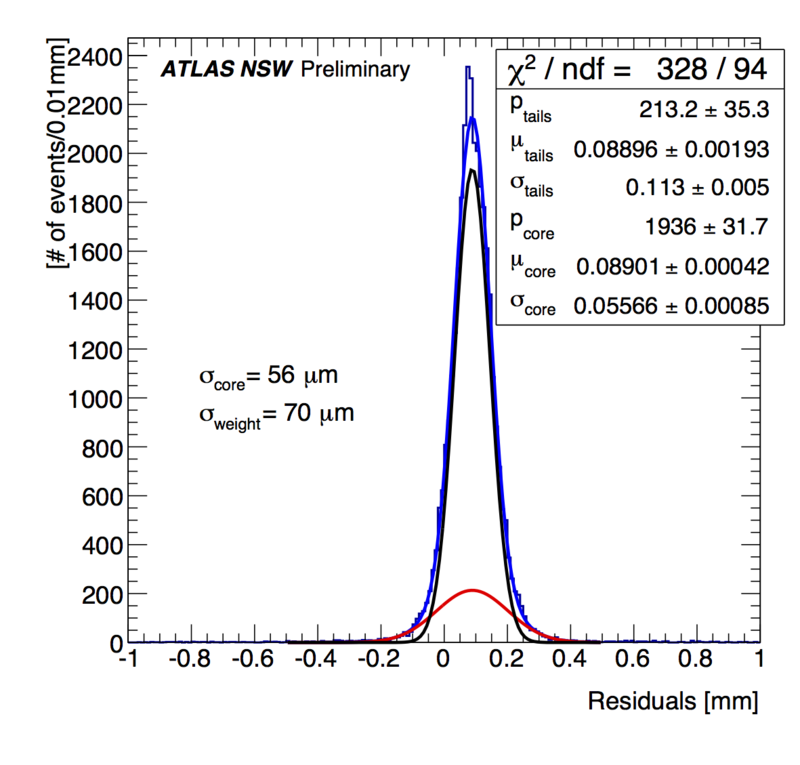 The residual distributions that are used for the extraction of the resolution are fitted with a double gaussian to take into account also the tails. For the resolution plot shown here the resolution is defined as the σ of the core gaussian. Spatial resolution using the charge centroid method (blue triangles), the μTPC method (full red circles) and the combination of the two (black open circles)” as a function of the particle incident angle. The resolution is obtained from the residual distribution of the hit position difference between two Micromegas chambers separated by a small distance. The reference track is built from all four hits in the sTGC quadruplet. The reference track is built from three hits in the sTGC quadruplet, excluding the first hit for which the residual is computed. 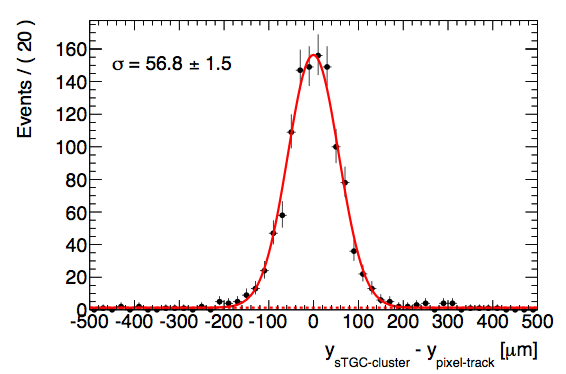 The reference track is built from hits in three pixel layers before and after the sTGC quadruplet. The sTGC trigger data serializer (TDS) ASIC chip is responsible for the preparation of trigger data for both pads and strips with additional task of serializing data for transmission to the circuits on the rim of the NSW detector. The serializer is realized in IBM 130 nm CMOS technology. It is adapted from the CERN GBT serializer, with changed architecture from loading 120 bits at 40 MHz to loading 30 bits in parallel at 160 MHz. The serial output is at 4.8 Gbps. The eye diagram is evaluated in a 12.5 GHz bandwidth, 50 GS/s oscilloscope with a PRBS-31 pattern. The height of the eye is measured to be about 540 mV, and the width is about 180.3 ps. 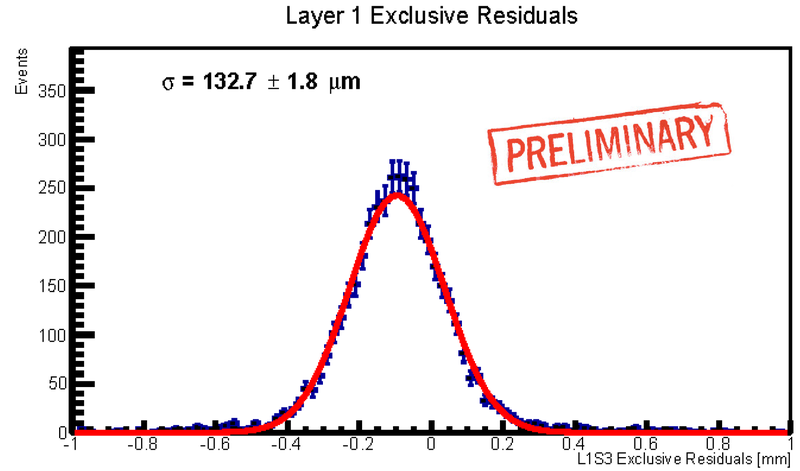 Jitter analysis shows that the total jitter at a bit-error-ratio (BER) of 1E-12 is 49.7 ps. A BER test with embedded PRBS checker inside a Xilinx 7 FPGA was also performed. An error free running of three days has been achieved, which corresponds to a BER less than 1 E-15.